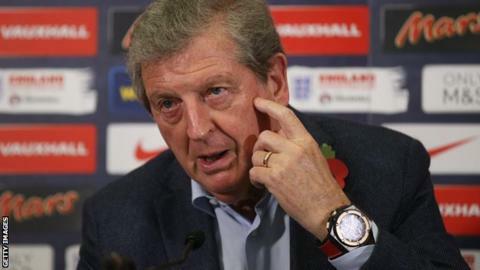 England boss Roy Hodgson says he feels luckier than Stuart Lancaster, having kept his job after an early exit from the World Cup last summer. Lancaster left his post as head coach of England's rugby union team on Wednesday after his side went out of the Rugby World Cup in the group stage. Hodgson was retained despite his team suffering the same fate in Brazil. "I was more fortunate that the FA kept faith in me at a time when results didn't go as they should," he said. "They could, if they had wanted to, have decided to change course. Stuart wasn't so lucky." Hodgson said he had been on leadership courses with Lancaster and found him a "very interesting coach and leader". He added: "It's a purely personal affiliation. It's got nothing to do with whether the RFU is doing the right thing or not." Since their World Cup exit, Hodgson's men have gone 15 games without defeat, including winning all 10 of their Euro 2016 qualification matches. They face European champions Spain in Alicante on Friday before meeting Euro 2016 hosts France at Wembley next Tuesday. "I'm grateful the FA kept faith with me and the work we were doing with a good team in a transitional period," said Hodgson. "We're still in that transitional period to some extent because, if anything, the team's getting younger. "But the young players are getting a lot of experience. So even though some of our players are only 20-21 years of age, they're already up to 20 caps and have been playing regularly for a couple of years." Captain Wayne Rooney has been the mainstay of the England team throughout that transitional phase. But he has acknowledged he faces "a huge challenge" to keep his place in the face of an emerging generation of rivals. Rooney, 30, will sit out the Spain game, with in-form Leicester City striker Jamie Vardy also expected to be absent because of a knock. Tottenham's Harry Kane will start Friday's game up front, with Rooney returning against France. As well as Kane and Vardy, the Manchester United captain may also face competition from Liverpool striker Daniel Sturridge and Arsenal's Theo Walcott for a spot in the starting line-up at Euro 2016. Manchester City's £49m summer signing Raheem Sterling can also play up front, and Rooney said: "I think there has always been competition and you want to play all the games. "But you have to understand I have played a lot of games for England and players like Jamie Vardy have come in and done well." Rooney became England's all-time record scorer with his 50th goal for his country in the European qualifier against Switzerland at Wembley in September. He added: "If the manager needs to have a look to see what he can do at international level you have to understand that, but of course it's a huge challenge to keep your place in the team and that's what I want to do." In 34 appearances under Hodgson, Rooney has scored 22 goals and contributed five assists. "I want to prove myself," he added. "I feel, certainly since Roy has been in charge, my international form has been great, I have scored a lot of goals and I hope that will continue." Kane is likely to be England's only recognised striker in Alicante. The 22-year-old is likely to link up with Everton attacking midfielder Ross Barkley, who Hodgson predicts has an "incredibly bright" future. He said: "My opinion hasn't changed since we brought him into the squad - and it feels like an eternity ago, certainly well over two years - he is a bright young talent. "Every time he has come to us we think he is a bit better, particularly in the last two games against Estonia and Lithuania, when he started both games and he was man of the match in certainly one. "I feel like the future is incredibly bright for a player like him and it is up to him, as he has said so many times himself, to keep working, to keep developing his game and improving and making sure that whenever the team is announced he is a name I cannot possibly leave out." Diego Costa could start for Spain, despite scoring just once in nine appearances since opting to play for the European champions rather than his native Brazil. The 27-year-old striker has scored three goals for Chelsea this season, and has been criticised for his robust approach. But Rooney defended Costa's physicality, saying that is what makes him the player he is. He said: "I voted for Costa as player of the year last season because I think he was a huge player. I think what Chelsea missed the season before was that fight up front, and he gave them that. I strongly believe that's why they became champions. "Obviously it hasn't gone as well as it did last season for him but I think he is a fantastic player. He's a fighter and I think that's part of his game and it going to be very difficult for anyone to ask him not to do that. "I feel that's in him - that fight. He thrives on that and that gets his team-mates going as well."